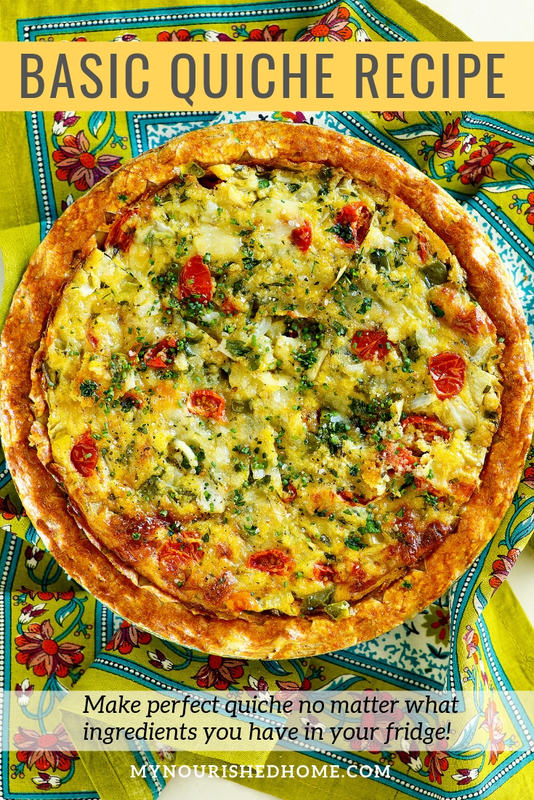 Quiche is one of those dishes that make me feel like I can really cook. It also seems to impress people. 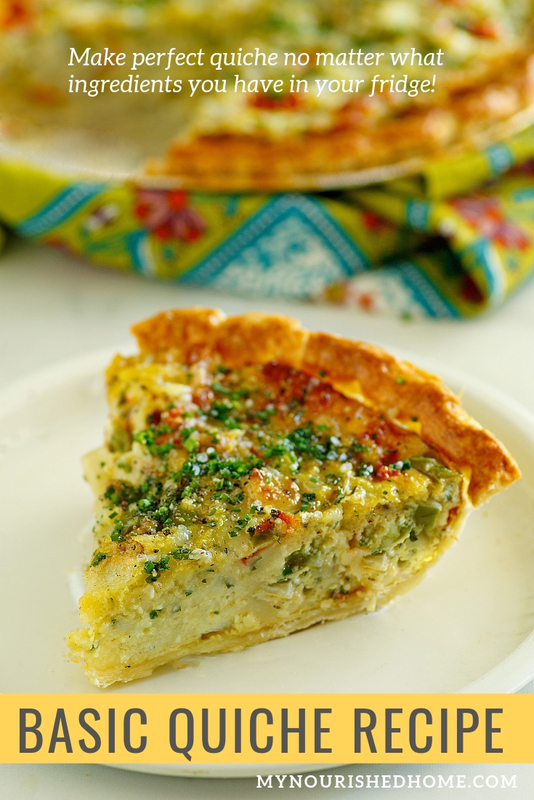 But I will let you in on a secret, a good basic quiche recipe is a simple as pie (see what I did there…) It is also one of those recipes that can save the day when you haven’t planned dinner or haven’t gone to the grocery store in two weeks. 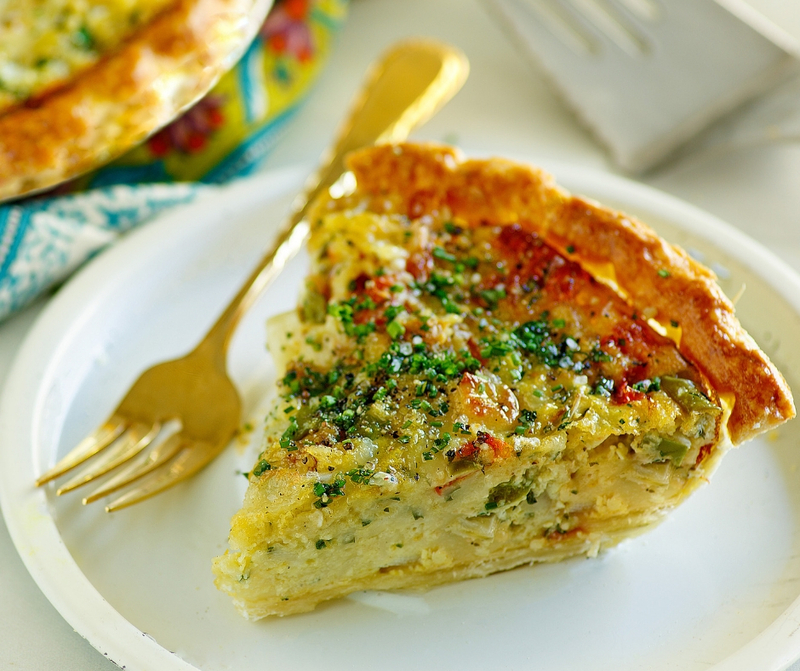 When I first started trying to simplify quiche, I wanted it to be the equivalent of Friday Soup or Sunday Stew (or Jambalaya!) or whatever your grandparents called it when they cleaned out the fridge and put all the leftovers in one pot to make dinner. This recipe has worked well for me because it is a base that allows me to make a really good meal out of what might not have made it back out of the fridge until cleaning day. I have used all sorts of combinations – and list a few of my favorites so feel free to make quiche totally on purpose – but also keep quiche in mind for using up the last of the Christmas ham, the spinach you wanted the kids to eat but they refused, the tomatoes that were not going to make it another day, the last of a block of cheese someone missed when they opened a new pack. Feel free to use your favorite store-bought pie crust. Though you might want to make sure the brand does not taste too sweet. When I make pie crust dough, I make several batches and freeze them – think lots of backup pie crusts, one set of dishes to wash. The night before, I just move a frozen dough to the refrigerator to thaw overnight. There are tons of pie crust recipes online but I really like this one from the Eating From the Ground Up. One of the things I love about this recipe is that the measurements are easy to memorize so I don’t have to search for the recipe if I am in a pinch. It is also super fast to get in the oven. Make sure you have a deep dish pie pan so the eggs don’t cook over the edges. Also, I sit my pie plate on a sheet pan just in case. I have only ever had to clean egg out of the bottom of my oven once and that was enough of a lesson not to take the chance. You can stretch to 6 eggs from the 5 the recipe calls for if you have a deep dish pie plate… see tip above. Oy. Use any kind of milk except skim. Two percent, whole, whatever. I have even used milk made from peas as a dairy alternative. Cook all meat first because nobody likes raw bacon in their breakfast. Cook any veggies that release a lot of water first. I dump them in with the meat after it is browned and drained. Think mushrooms, tomatoes, zuchini… etc. Don’t cook fresh herbs ahead. They taste more flavorful added into the egg mixture at the last minute! Try lots of different kinds of cheeses because they are all delicious! 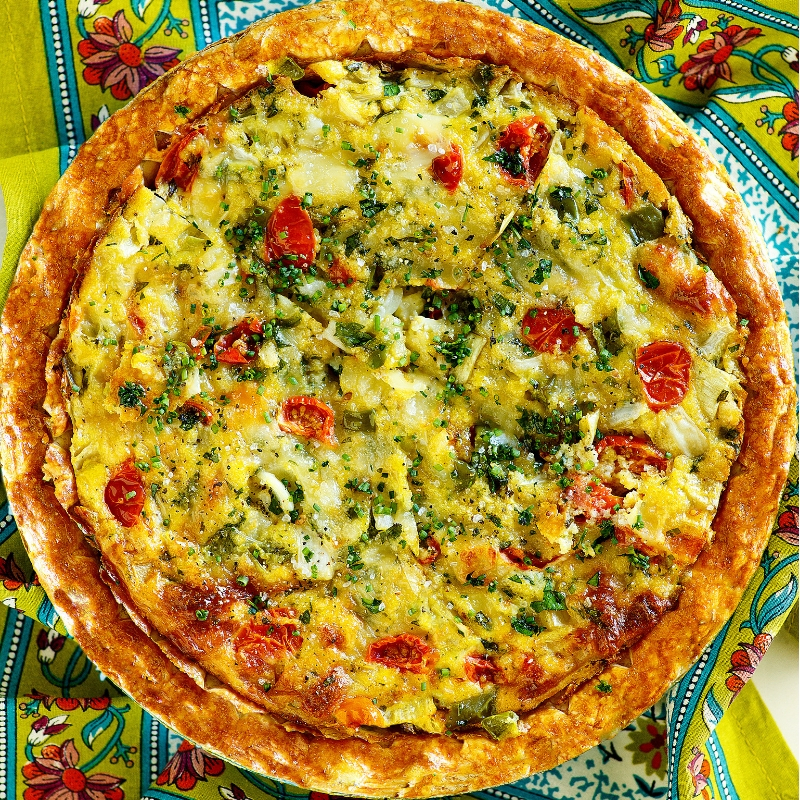 What are your favorite flavor combinations for quiche? 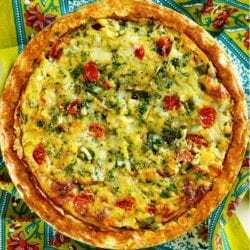 When I have a little more time in the kitchen, I also love to make this Asparagus Quiche. I think it looks so beautiful on a spring table! Pre-cook a whole wheat pie crust. In a large skillet over medium heat, cook any meat or veggies. Drain any grease from the pan. Add drained mixture to the pre-cooked pie crust. In a large bowl mix together the eggs, milk, herbs. Salt and pepper to taste. Stir in the grated cheese. Pour the egg filling over the meat and veggie mixture in the pie crust. Make sure the cheese is evenly distributed across the top of the quiche. 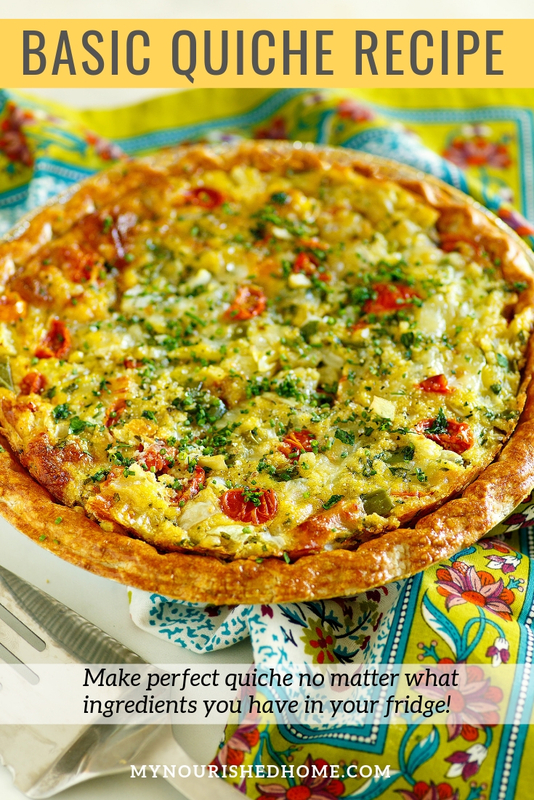 Put on a baking sheet and bake until the quiche has set and top and crust has browned, about 30 to 35 minutes. Hi Karen. Glad you found your way to the site. Enjoy the recipes! Let me know if there is anything you would like to see more of!